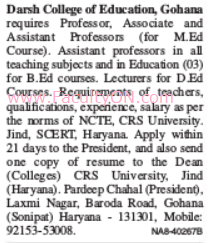 Darsh College of Education, Gohana has advertised in the TRIBUNE newspaper for recruitment of Professor / Associate Professor / Assistant Professor / Lecturers jobs vacancies. Interested and eligible job aspirants are requested to apply within 21 days from 28th September 2018. Check out further more details below. About College: Darsh Model Degree College, Gohana is run by Darsh Education and Welfare Society. Society moved an application to Education and Language Department Government of Haryana, Chandigarh, has been received from the same department for setting up Darsh Model Degree College at Village Kailana Tehsil Gohana.